The Maysville Floodwall Mural project began in the summer of 1998. The early river history of Maysville has been created on the floodwall through murals created by Robert Dafford of Dafford Murals from Lafayette, Louisiana. Murals on the floodwall serve several purposes providing a way to showcase the history of the town, beautify the floodwall and promote tourism. Only one mural is photographed on this App. However, a description on all of the Murals has been listed to entice you to see them for yourself. The best way to view the Maysville Floodwall murals, are at the entrance to Limestone Landing. They visually demonstrate the historical connection of the Ohio River to Maysville. The murals move west from the Limestone entrance, chronologically illustrating four seasons and illustrating changes in transportation technologies and growth in Maysville. Then after coming back to Limestone Landing, another mural can be found hidden on the east side of Limestone Landing which shows someone near and dear to all of us in Maysville. The frames for the larger images use Museums motifs from specific downtown buildings. This mural shows a group of Shawnee Indians in the 1600s on a bison hunt in the middle of a harsh winter. The Shawnee Indians at this time would have lived north of the Ohio River but used what is now Kentucky as a hunting ground. Woodland bison were plentiful in the Ohio River Valley region, and often moved over the noted game trails, now known as Buffalo Trace, southward to an area that is now called Blue Licks, for the salt licks. LIMESTONE LANDING 1780s Spring time in the late 18th century shows the limestone shelf which gave the place its early name, ‘Limestone Landing’. While the formation provided a good place to dock, few settlers remained on the river bank. There were limited opportunities for farming at Limestone, and the vulnerability to Indian attacks from across the river. After landing, most settlers migrated southward using the Buffalo Trace or Limestone Creek into safer locations. Generally the first stop was Washington. It was a full days journey from Limestone Landing for freight using draft animals. Keel boats and flat boats that were used for river traveling were often dismantled and transported south where they were rebuilt into housing. One such structure, Mefford’s Fort still exists in Old Washington, section of Maysville. LAFAYETTE’S RECEPTION 1825 On May 21st 1825, General LaFayette, his son, Colonel George Washington LaFayette, and the Governor of Ohio reached Maysville on the steamer Herald. The reception tendered this great visitor was one of the most colorful celebrations ever held on Maysville soil. and John Chambers, Francis Taylor and Dr. J.N. Taliaferro of Washington. Landed at the decorated wharf, LaFayette was greeted by a mad throng. Carpets, given by John Armstrong, a wealthy merchant of Maysville, lined the grade leading to what is now Front Street. SUTTON’S LANDING 1850s Summer time; the river bank along Water Street, was the original name for Front Street. The banks are lined with various modes of wheeled transportation that included a side wheeled steam boat, stage coaches, ox carts and drays of every description. The buildings which face the river are of brick construction and show predominance of new houses in the area. As a result of the floodwall construction and urban renewal projects, an entire block of Federal-period architecture was demolished. Keep in mind these buildings were built for shipping business. The three storied building on the left, known today as The Lee House, what was originally named the Washington Hotel, was built circa 1798. Famous guests include Henry Clay, the Marquis de Lafayette and Andrew Jackson. (The original guest register is on display at the Kentucky Gateway Museum Center). After a complete renovation, the Lee House has been changed into upscale apartments. THE UNDERGROUND RAILROAD This mural symbolizes the plight of escaping slaves using the Underground Railroad. The artist shows hidden messages, that according to oral history, communicated to the slaves the route and timing for passage to freedom. For example the quilts hanging on the split rail fence carried encoded messages as well as the Big Dipper constellation showed the fleeing slaves which direction was north. Across the river and high on the bluff is the small house belonging to the Reverend John Rankin, a noted abolitionist and stationmaster conductor of the Underground Railroad. A light in the window indicated the timing was safe for passage to the house. The escaping slaves freedom was still in jeopardy until they reached Canada. This panel is dedicated to Maysville singer and movie star – Rosemary Clooney. Rosemary insisted that the world premier of her first movie ‘The Stars are Singing’ be held in her hometown of Maysville at the Russell Theater. In honor of the event, the community hosted a parade that is said to have attracted 20,000 people. That parade, shown on the right half of the mural features Rosemary riding in a convertible with her maternal grandmother and also her good friend Blanche Chambers. The left side of the mural shows Rosemary Clooney taken from a publicity photograph. The entire mural is framed with the facade of the Russell Theater in honor of where the movie was premiered. The small inset on the right corner of the panel highlights the stars of ‘White Christmas’ Bing Crosby, Danny Kaye, Vera Ellen and Rosemary. 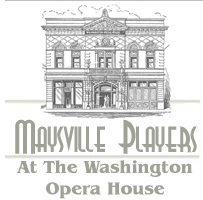 The small inset on the left corner shows Rosemary, her sister Betty and best friend Blanche Chambers and Blanche’s sister singing on the street corner in downtown Maysville. The gold and brown tones of autumn provide the backdrop for this panel showing the communities continued growth with housing and business development along Water Street. Transportation has progressed with the introduction of the railway system. This changed Maysville’s sole reliance on the river by providing both freight and passenger transportation adding to the communities economic prosperity. A change in character, this panel depicts the Germantown Fair. A county event known as ‘Old Reliable’ for being in existence for over 150 years. As seen in the mural, the featured event is the horse show, which showcases saddle bred and trotting horses. This is still a grand event and winning carries high honors throughout the community. This mural depicts Market Street in the 1920s and 1930s. It is obvious this street played an important role in the daily lives of adults and children alike. Retail shops adorn both sides of the brick streets and the transportation theme has returned by featuring the introduction of the automobile. The bandstand in the mural shows the role Market Street played in the social lives of the community. That tradition holds true today as the successful renaissance of Market Street still plays host to musical and special events throughout the year. This mural is dedicated to the role tobacco has played in the agricultural and economic livelihood of the community. It shows the tobacco in the process of being cut and housed for curing. At one time Maysville was the second largest Burley tobacco market in the world. At its peak there were eighteen sales warehouses in town handling up to 90 million dollars in annual sales. Along with associated facilities: re-dryers, storage and sales, the tobacco crops had a significant impact on the local economy.